The Philippine Early Childhood Development (Phil. ECD) Checklist is designed for service providers like teachers, rural health midwives, child development and day care workers, parents/caregivers who can easily administer after a brief training period. By using the checklist, they will be able to determine if a child is developing adequately, or is at risk for developmental delays. This Checklist is NOT intended to be used to 1) make a medical diagnosis; 2) determine a child’s intelligence quotient or IQ; or 3) gauge his academic achievement. It is only the first of several steps in a comprehensive assessment process that a child at risk is expected to go through so he can get the help he needs as early as possible. 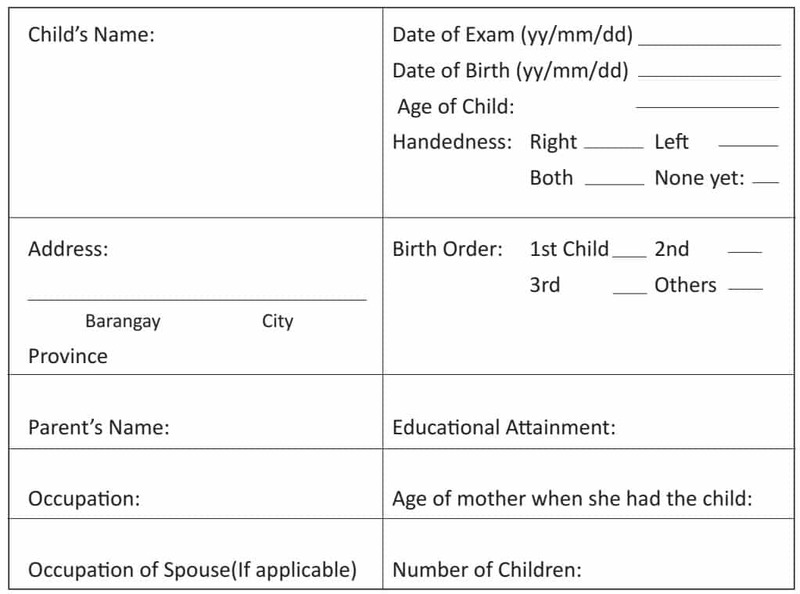 The Checklist consists of a Child’s Record, divided into two parts: Child’s Record 1 for children aged 0 months to 3.0 years; Child Record 2 is for children aged 3 years and 1 month to 5 years and 11 months. The items in the Checklist are grouped into seven domains: 1) gross motor, 2) fine motor, 3) self-help, 4) receptive language, 5) expressive language, 6) cognitive, and 7) social-emotional. The Child Record 2 will be utilized for the kindergarten learners of the Department of Education. The choice of items was based on statistical validation while the test has been normed based on a sample of 10,915 children from the NCR, III, VI, VII, VIII, and XII. The Checklist is thus a product of careful refinement and validation. It is a monitoring tool suited to the needs of the Filipino child. We hope that this Checklist will serve as a valuable tool not only in monitoring the Filipino child’s growth and development but also in ensuring that he or she enjoys a care and nurturing environment, thus assuring him or her of a secure tomorrow. The Checklist can be administered in a setting familiar to the respondents. Ideally, the place should be relatively quiet, well lighted and ventilated, and have a table and chairs to provide comfortable conditions for the respondents and examiner. If conducted outdoors and there is no table, any flat work surface will suffice. The examiner can employ various methods to determine if the child exhibits specified behaviour. These include observation, direct elicitation of the behaviour from the child, and also interview of the parents(s) or caregiver(s). When interviewing the parents(s) or caregiver(s), the examiner may wish to use the opportunity to ask them what activities they do at home to stimulate the development of their child. Their responses can be recorded on a separate sheet. Older children aged 2.6 years and above may be tested in small groups of 2-3 similarly aged youngsters if the examiner feels this will make them more responsive to her queries and request. This especially if they have not had any day care or pre-school experience. Each form of the revised ECD Checklist should not take more than 45 minutes to administer. Rapport-building is very important, especially when the child is not familiar with the examiner. So be sure to spend a few minutes interacting with the child by playing or chatting with him. It may help when the items, which involve interviewing the parents / caregiver, are administered first with the child nearby. This will make him realize that the examiner is a kind, caring person and facilitate the rapport-building process. The examiner must emphasize that there are neither right or wrong answers nor good or bad scores. This will assure greater accuracy in what parents/ caregivers report and decrease the incidence of a child’s giving an answer based on what the others in the group have said. The examiner must refrain from “teaching” the correct answer because this Checklist is intended to be given to the same child at a later point in time. If the child has been taught the answer, it will be difficult to determine if his success was due to this or to his expected maturation. Answer that do not seem to exactly correspond to the intent of an item are to be written in the “Comments” column of the tool. These can serve as reference points of a child’s progress when the checklist is administered to him again at a later date. We are here to help you find out how your child is developing by asking you some questions about the thing he is able to do or having your child do some activities. There is no pass or fail score. This is just a checklist. Some of the questions are for children older than your child so I do not expect him to be able to do all the things I will be asking. We plan to administer this Checklist two times: upon entry to kindergarten and at the end of the school year. So please do not teach or coach him because it is important to know just what he can and what he still cannot do at this age. Later on we will share the results with you and give suggestions on what else you can do to stimulate your child’s development. The front page of the Checklist includes the portion of the sociodemographic information of the child that must be filled out completely. Compute the child’s age by subtracting the date he was born from the test that was administered. Hence, in this example the child’s age is 2.9 years. There is no rounding off. Please note that each month consists of 30 days. The Checklist is divided into 7 domains: Gross Motor, Fine Motor, Self-Help, Receptive Language, Expressive Language, Cognitive and Social-Emotional. The column labeled “Materials/ Procedure” gives specific instructions on how to observe the child or elicit the required responses, as well as some criteria on how to score the responses. If the behaviour or response is present, place a check ( V ) in the “PRESENT” column. If the behaviour or response is not yet present / observed, indicate this via a hyphen ( – ). The examiner may demonstrate skills in the Gross Motor, Fine Motor and Self-Help domains to make sure the child understands the instructions. However, unless otherwise specified, items in the Receptive Language, Expressive Language, Cognitive, and Social-Emotional domains should not be demonstrated. Some items indicate that the parental report will suffice. Other items indicate that the skill must be elicited by the examiner. For other items where neither of these has been specified, the examiner must try to elicit the skill. The examiner may ask the parent/ caregiver if a skill is present or absent only when she is in doubt about the child’s ability to display the skill, like if the child is not willing to respond/ perform because he is shy or not in the mood. If the child tries to do what is being asked but does not succeed, it is scored as “Not Present” (-). Any observation or comment regarding a specific item or the response of the child may be written in the last column labeled “Comments”. Examples of such remarks include: item is not applicable; lack of opportunity, response was not displayed 2 out of 3 trials, etc. The examiner must be careful not to teach the item or allow the parent/ caregiver to prompt the child. Also be careful not to make comments like “correct”‘ “very good”, “wrong”‘ etc. or show via facial expressions or gestures that a child is doing well or not very well. However, you can praise the child for his efforts by saying things like “good job” even if he does not succeed with the item. This will help him maintain his interest in the different activities you are asking him to do. Sometimes the child can actually do an activity but just needs a little coaxing. In such instances, gently encourage the child to give the task a try and remind him that he is not expected to succeed all the time. Comparing him to his friends or other children in the group. The child is sick and not feeling well. The child is crying and not disposed to cooperate. If the evaluation has been deferred, disregard the results of the sessions where you could not complete administration of the Checklist. Consider only that which you obtained when the child was most responsive. If, after 3 sessions/ attempts, you are still not able to get the child to work with you, bring the matter up to the supervisor. 1. Tally the number of check marks (V) in each domain and record all this in the section labeled “Total Score”. The check marks (V) that you tallied in each domain are the raw scores. Ask the child to walk backwards by demonstrating this. Credit if the child is able to walk backwards without falling and holding on to anything. Encourage the child to run by rolling a ball across the floor. Credit if the child can run fast and smoothly without tripping or falling. 4. Walks downstairs, 2 feet on each step, with one hand held Automatically credit if item #6 is passed Parental report will suffice. Place a toy in the middle of the 4th or 5th step and ask the child to walk up the stairs to get the toy. Credit if the child walks up walks up the stairs using the handrail or wall for support and places both feet on each step before stepping on the next one. Automatically credit if item #6 is passed. Parental report will suffice. Place a toy in the middle of the 4th or 5th step and ask the child to walk upstairs to get the toy. Credit if the child walks upstairs, alternating his feet as he steps on each successive step without holding onto the handrail or wall for support. Parenting report will suffice. not give credit if the child places both feet on the step or uses the handrail or wall for support. Parental report will suffice. Ask the child to raise both arms. 9. Jumps up This must be elicited by the interviewer. Ask the child to lift his foot and hop at least three times on his preferred foot. Credit if the child is able to hop at least three times on his preferred foot without holding on to anything. Ask the child to jump while making a half-turn. Credit if the child is able to do this without tripping or falling. 13. Dances patterns / joins group movement activities Parental report will suffice. flat surface. Drop a small toy in front of him and attract his attention by pointing to the toy or tapping the table/flat surface. Credit if the child picks up the toy, using all 5 fingers as if raking. Automatically credit if he passes the next item. Place a toy/food in front of the child and within his reach. Attract his attention by tapping neat the toy/ food. Credit if the child uses the tips of his thumb and index or forefinger to pick up the toy/food. Place the toy directly in front of the child at midline (not to his left or his right) and ask him to reach for this. Credit if he uses the same hand 2 out of 3 times. Parental report will suffice. Present child with a crayon and have him get this. Credit if he holds it by wrapping all 5 fingers around as if making a fist. Automatically credit this item if he uses the tips of all 5 fingers or his thumb, index and middle fingers. This must be elicited by the interviews. 6. Unscrews lid of container or unwraps food MATERIALS: Container with screw-on top or wrapped candy. This must be elicited by the interviews. Place a paper and pencil/ crayon on the table or flat surface and ask the child to draw anything he wants without showing him what to do. Credit if the child uses the tips of his thumb and any of his other fingertips to grasp the pencil/crayon and makes purposeful marks on the paper (not accidental marks). Place a paper and pencil/ crayon on the table or flat surface and ask the child to draw vertical and horizontal lines after you have demonstrated these to him. Credit if the child produces a vertical or horizontal line that is at least 2 inches long and does not deviate or vary from your vertical line by more than 30 degrees. The lines may be wavy but not broken. Place a paper and pencil/ crayon on the table or flat surface and ask the child to draw a circle or a ball after you have demonstrate it to him. Credit if the child produces any curve that is closed or nearly closed. Continuous spiral motions are not credited. 1. Feeds self with finger food (e.g. biscuits, bread) using fingers MATERIALS: bread, biscuits This must be elicited by the interviewer. Note: The cup should not have a lid or spout. This must be elicited by the interviewer. Automatically credit if he passes the next item. This must be elicited by the interviewer. 12. Prepares own food/ snack Ask the caregiver if the child can prepare his own snack without help except for getting items that are hard to reach (e.g. bowl spoon). 25. Washes and dries hands without any help Ask the caregiver if the child can wash and dry his face without any help or supervision except to turn on/off faucets that are out of reach.